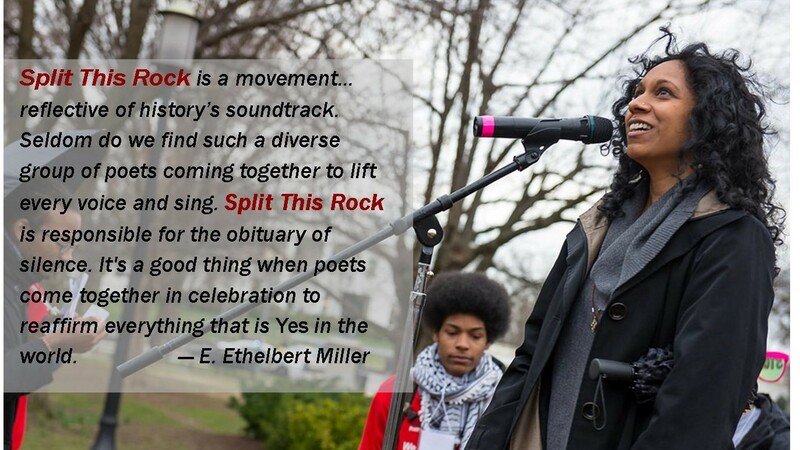 Split This Rock is a grassroots effort—a people’s movement begun in 2008 with the very first Split This Rock Poetry Festival, an outgrowth of DC Poets Against the War. Thanks largely to the support and participation of so many of you, the first Split This Rock Poetry festivals were tremendously successful. You—and many others—asked us to make the festival a regular event and to build Split This Rock into a permanent home for progressive poets. We've been building on that vision ever since and there's so much more to do! To reach our programming goals, we'll need your involvement. Would you invest in Split This Rock today? We hope you'll lend your support. With your help, we can continue cultivating Split This Rock as an organization that genuinely represents the diversity of progressive poets working in all areas of our country and in all poetic styles today. We're excited about the opportunities to improve and grow but it takes resources to get us there. Be part of making it happen! INVEST IN THE POWER OF POETRY TODAY! Help Split This Rock Take Bold Steps in 2019! Be sure to stay tuned as this year's campaign also offers exciting perks and giveaways! BIG NEWS! DOUBLE YOUR DONATION IN 2018! The Morris & Gwendolyn Cafritz Foundation has again given Split This Rock a tremendous vote of confidence: They will match every donation from a new supporter or increased gift from an existing donor, up to $10,000. Give Today & Honor a Poet's Legacy! Langston Hughes Circle ($10,000): Split This Rock’s name is drawn from the Hughes’ poem “Big Buddy”: Don’t you hear this hammer ring?/I’m gonna split this rock/And split it wide!/When I split this rock,/Stand by my side. June Jordan Circle ($5,000+): On the 10th anniversary of her death Split This Rock dedicated the 2012 Festival in June’s memory. Her poetry, prose, and teaching continue to inspire and animate Split This Rock’s work. Adrienne Rich Circle ($1,000+): Moved by the vision for Split This Rock, Adrienne sent Split This Rock’s founders a powerful letter of endorsement and a check for $1,000 to support the first festival. Lucille Clifton Circle ($500+): One of the first poets to say “yes” to featuring at the 2008 festival, Ms. Lucille, as she's fondly known, sadly was unable to attend due to illness. Split This Rock paid tribute to her at the 2010 festival, a month after her death. In her memory, her family has made the inaugural gift to the Lucille Clifton Circle. Francisco X. Alarcón Circle ($250+): A faithful attendee at Split This Rock Poetry Festivals, Francisco spearheaded Poets Responding to SB 1070, often partnering with Split This Rock, and worked tirelessly for immigration justice. Zahara Heckscher Circle ($100+): An active member of Split This Rock’s network, Zahara invented the Poetry Game, presenting it at festivals and designating a portion of proceeds to supporting Split This Rock. Maxwell Corydon Wheat Jr. Circle ($1-99): After being fired as Poet Laureate of Nassau County, NY for writing poems against the Iraq War, Max was declared Poet Laureate by the community’s poets. An attendee and panelist at Split This Rock’s first festival, Max mailed $5 checks to Split This Rock every month until his death in 2016. Split This Rock is featured in the 2017-2018 Catalogue for Philanthropy as one of the best small charities in the Greater Washington region. Visit Split This Rock's page to give today! Donations given through the Catalogue portal incur the lowest transaction fees. Here are just a few ways your contribution can help. 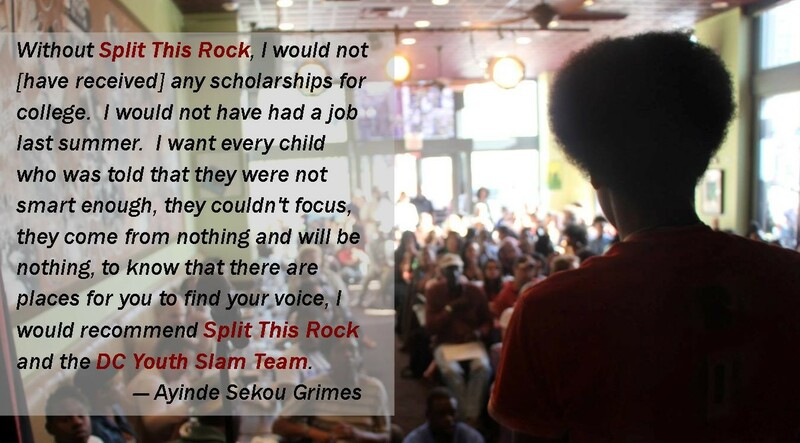 help us send a dynamic teaching artist into a DC-area school or afterschool poetry program for one month and pay them! Every dollar given enables us to raise the platform higher for poetry that bears witness to injustice and provokes change. The work of Split This Rock depends on a strong financial foundation. Your tax-deductible funds and support enable us to: organize a unique national biennial poetry festival, two youth poetry slam festivals, as well as other public workshops, open mics, readings, and events; foster opportunities for poets to participate in creative activism for social justice and peace; support the growth and voices of teen poets by exposing them to extraordinary adult artists as mentors; offer DC area teachers lesson plans that make poetry an engaging and relevant part of their curriculum; celebrate and award the outstanding work of poets combining poetry and activism; and provide resources that inform and inspire poets, equipping them to play an active role as public citizens. Gifts of any size are deeply appreciated. We hope you'll consider giving $50, $100, or more. Everyone who donates will be thanked on the website. And if you’re able to give $100 or more, you’ll be thanked in the 2018 Split This Rock Festival program or other printed materials. 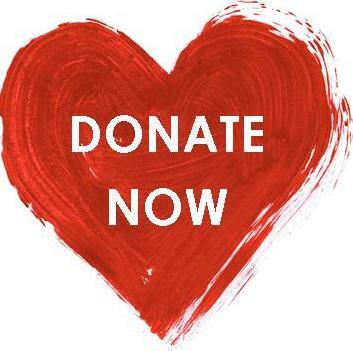 Click the "Donate Now" heart or the heading above to give online. Top photo by Kristin Adair.